Photo by Lake Juanluska staff. Lake Junaluska has announced the theme for its 2017 Summer Youth Events: "Love Your #Selfie: Appreciating God's Masterpiece in the Mirror." The theme was created to inspire youth groups over the course of six events taking place at Lake Junaluska from June 11-July 2. All youth groups are invited to register for the events. Tammy McDowell, the assistant director of program ministries, said the new theme will bring energy to the Summer Youth Events, infusing them with relatable dialogue surrounding insecurities that youth share. "Many youth have self-esteem issues which can be addressed by having a proper view of their beauty and significance," McDowell said. "By looking through God's eyes, they will be able to see that their uniqueness is God's special thumbprint in the world." The inspiration for the theme came from Psalms 139:13-18 and Ephesians 2:8-10, both of which talk about God's intentionality in creating each person exactly the way they are. Diverse speakers from across the country will delve into these topics. "We strive to develop creative messages that attract and connect with youth," said Jack Ewing, executive director of Lake Junaluska. "As has been the case for more than 100 years, when youth come to Lake Junaluska in 2017, they will experience God's transforming love through Jesus Christ and return home transformed and renewed." Each of the program weekends at the Lake Junaluska Summer Youth Events includes worship bands, speakers, special meals, lodging and a focus on giving. The mission project this year aids Rise Against Hunger, an organization with a goal to end hunger in our lifetime by providing food and life-changing aid to countries in need. Youth will pack meals to serve this cause. Free time is also built into each afternoon of the event for groups to engage in rafting or zip lining adventures, do additional service projects in the surrounding communities, or enjoy the recreation activities at Lake Junaluska. 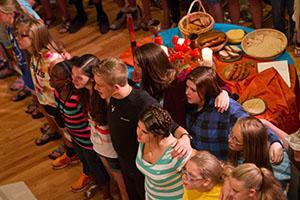 The youth events are for designed for youth groups of sixth through 12th graders. Registration is now open. Packages include housing, meals and the program. For more information about Summer Youth Events and the summer schedule, visit www.lakejunaluska.com/summeryouth or call 800-222-4930. Lake Junaluska is a place of Christian hospitality where lives are transformed through renewal of soul, mind, and body. For more information about Lake Junaluska programs and events, visit www.lakejunaluska.com.